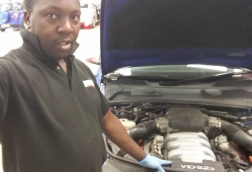 I am originally a self taught mechanic from an engineering background and I repaired cars in my own time from 2004-2007, I realised I needed to have official qualifications so I attended Middlesbrough College and attained my NVQ Level 3 (IMI advanced Level 3 That includes Vehicle science and Electronics). I moved to work 2 years for Quicks and Evans Halshaw, subsidiary dealership companys of Pendragon, before setting up my own business in 2015 called Kosi's Car Repairs. The business caters for all makes/model of vehicle and works on all repairs including electrical diagnostics. I am also an active nominated MOT tester. Very efficient, will use this service again. Good value for money. Very happy with work undertaken. Kosi was a very friendly mechanic gave me some helpful advice would use again. Very friendly and seemed to understand what was needed for my car. Really nice guy. Yes, Kosi did an excellent job. He was very diligent and professional, and he answered with clarity all the questions I had about the car. He took many pictures and a video of the interior and exterior of the vehicle, something that was very helpful for me. Thank you again! Kosi was polite efficient and helpful. I will definitely use him again. Very impressed. Kosi was friendly and knew exactly what the problem was with my car. Very satisfied with the work and the cost. Will use again and highly recommended.